We are listed on MyCryptoCheckout, a cryptocurrency payment processing plugin which is used on thousands of WordPress based online businesses and stores. According to Digital.com, “The reason behind this success is the unparalleled versatility that allows WordPress to be deployed everywhere from small personal blogs, small business websites to powering Fortune 500s like Sony Music and the Forbes blog”. According to Digital.com, “ WordPress is responsible for an additional 1.1 million domains every 6 months or so. Users love the convenience and nearly effortless way how to establish an online presence”. According to Digital.com, “ With 131 million unique visitors per month, WordPress is more visited than Twitter, which gets “only” around 114 million unique visitors per month”. MyCryptoCheckout is one of the most popular cryptocurrency payment processing plugins for WordPress based websites. As above statistics show, WordPress is an extremely popular content management service/platform which is loved by millions of people all over the globe. MyCryptoCheckout plugin supports over 94+ coins including but not limited to: Bitcoin, Ethereum, Dash, Litecoin, Monero, Zcash, Bancor, and OROX. You can view the full list of 94+ supported coins HERE. 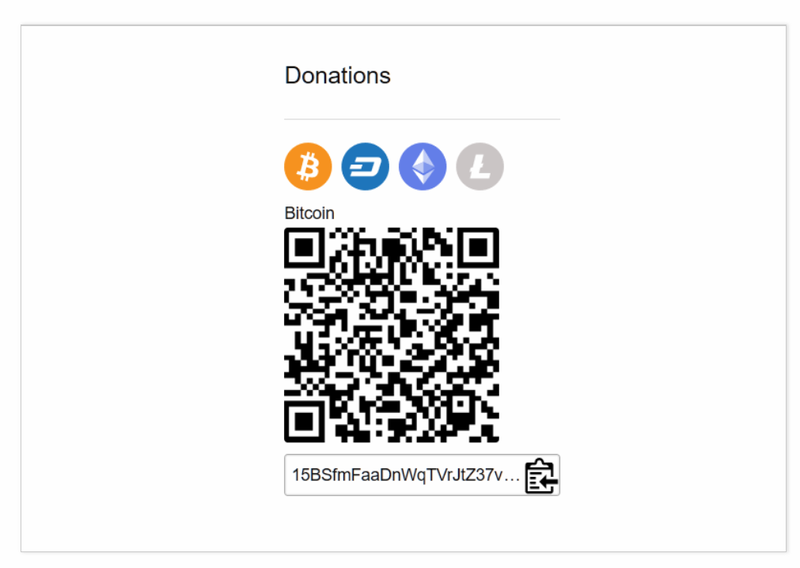 The plugin can be used to set up cryptocurrency payment options on WooCommerce and EasyDigitalDownloads plugin supported stores as well as a feasible option to start accepting cryptocurrency donations. With over a million users using WordPress to power their online businesses and stores, it is essential that they accept a variety of payment options — including cryptocurrencies. The best feature of MyCryptoCheckout is that it has no middleman fees and funds are processed 100% on the client-side — meaning, no internal wallet or 3rd party wallet usage is required. Users can set up their stores and start accepting payments directly into their personal cryptocurrency wallets & addresses with MyCryptoCheckout. The plugin constantly updates prices of coins & tokens via the CoinMarketCap API. This ensures that you are accepting coin & token payments at the right price. You can even set up markup prices or % on each orders received to ensure that no loss is made on your end. 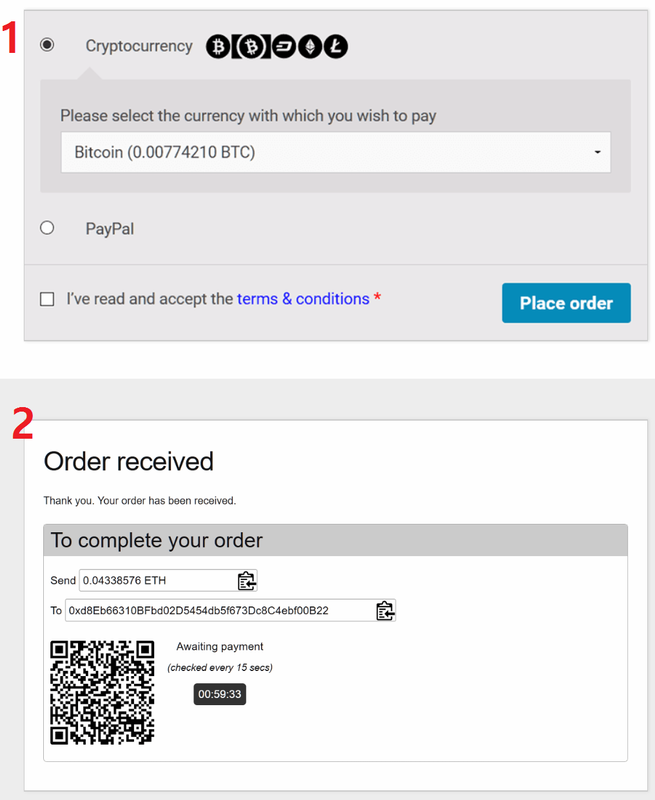 On the main settings page for WooCommerce, you will be able to enable MyCryptoCheckout and configure the basic things to get your online store up and running to accept cryptocurrency payments. 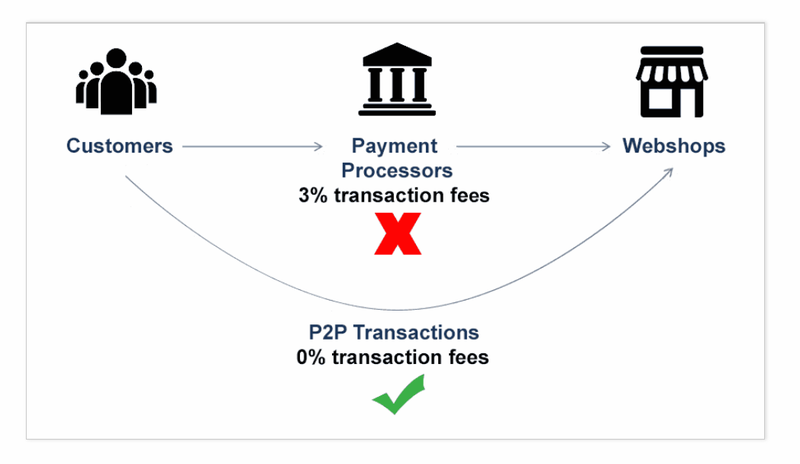 The plugin supports truly peer-to-peer transactions and charges 0% fees on all transactions. Fees can be critical especially for online stores processing hundreds of orders per day. Perhaps the best feature of it all is in the fact that MyCryptoCheckout does not require you to enter any details within the store. Online payment processing plugins usually require customers to fill in basic payment information such as their cryptocurrency address or credit card details. However, MCC does not require you to do so. This reliable plugin also allows users to accept cryptocurrency donations on their WordPress based blogs or websites. 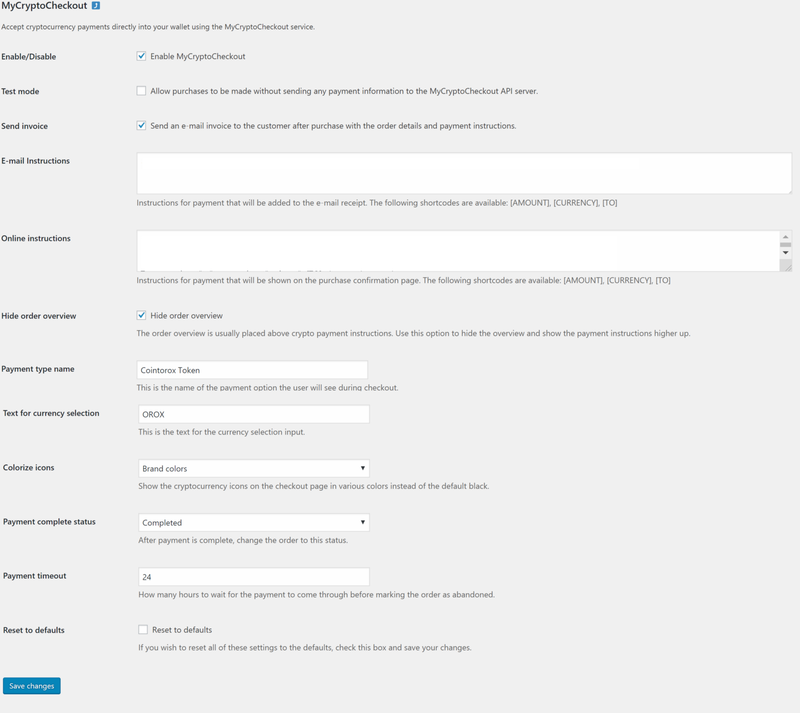 Setting up your own custom donation shortcode (a type of code used on WordPress based websites to easily integrate plugin features and themes) to use on pages and posts is easy. Simply head over to the Settings -> MyCryptoCheckout area and fill in the relevant information required. 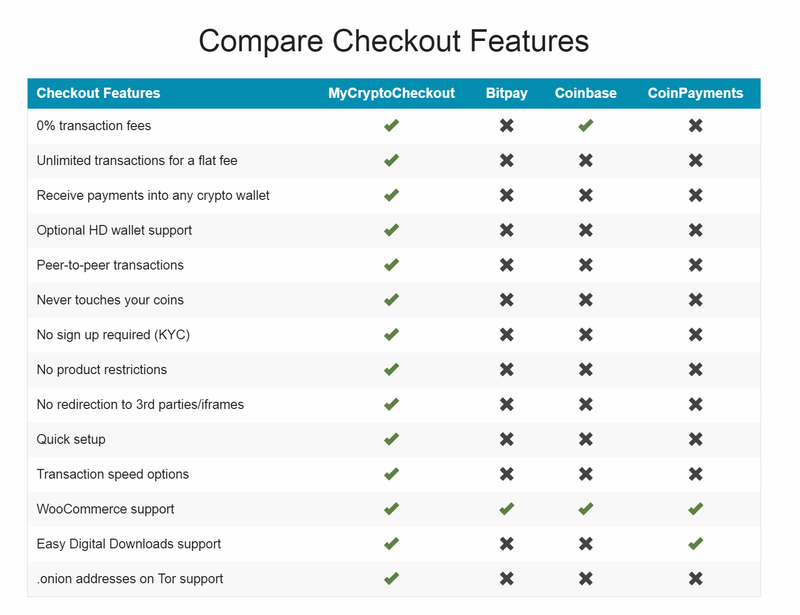 Why Accept Cryptocurrency Payments with MyCryptoCheckout? The image above says it all. 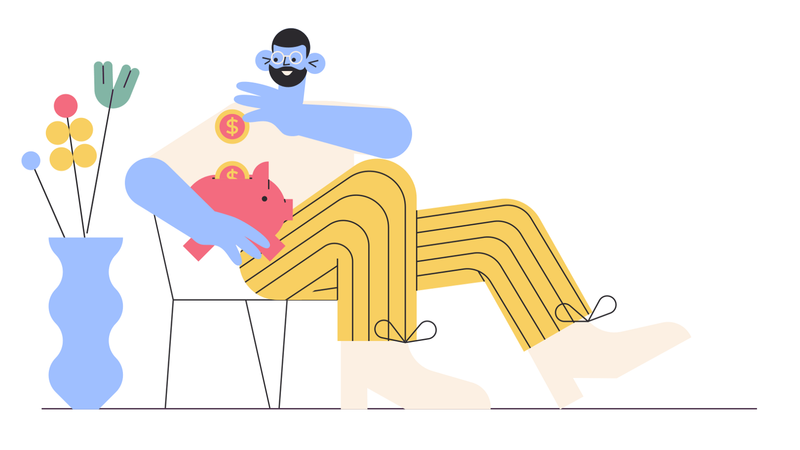 For every $1 paid, merchants are able to save 2.6% — 2.75%. Fees directly impact on the success of online businesses and thus, it is a critical consideration to be made for all online based businesses. There are many other cryptocurrency payment processing plugins out there but none comes close to MyCryptoCheckout. What does all these have to do with COINTOROX? We have partnered up with the MyCryptoCheckout team to integrate Cointorox Token (OROX). The popularity of WordPress based websites and online stores are growing on a daily basis and so thus the popularity of MyCryptoCheckout plugin. For a cryptocurrency project to have coins or tokens accepted as a form of payment on multiple stores is a BIG thing. More like an ESSENTIAL thing. It contributes to the sustainable growth of the demand for the coin/token and proves that it is backed by real-world-values instead of grand promises which are vague and unrealistic. Cointorox will continue working to form partnerships with various online merchandise stores and businesses to ensure that Cointorox Token (OROX) can be used to purchase various goods and services offered on the internet.